SuperHosting is one of Bulgaria's biggest website hosting companies and have made a name for themselves offering shared hosting services with great features and affordable pricing. If you want a host that supports large databases, this is one that should be on your list to check out. 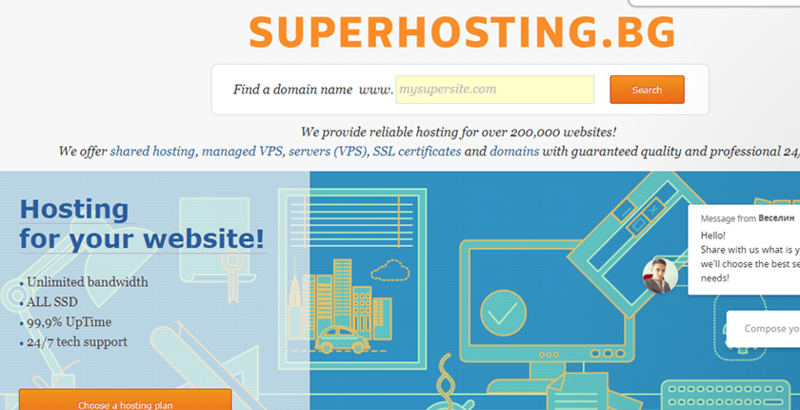 SuperHosting is a Bulgarian web hosting service that’s been in operation since 2007. During that time, they have hosted over 200,000 websites, including corporate websites, hospitals, universities, and more. They offer the choice of both SSD and WordPress hosting with excellent features at reasonable prices. The default database size is 1GB, but their SuperHosting allows for up to 4GB in database space. That’s excellent and rarely offered on any hosting service. SuperHosting is best suited for competent beginners and up as they don’t offer a drag and drop website builder. They do offer Softaculous which will allow you to install WordPress and most any common CRM software. You can also install your website using their cPanel. With support Perl, C++, and Python, power users have the freedom to build their best website. The great part about this service is that the pricing is no different for WordPress or SSD hosting, so if you know you’re staying with WordPress for the long haul, there’s no real reason not to go with WordPress hosting. Personally, I would still choose SSD hosting as it offers a bit more flexibility if you want to host non-WordPress sites. The price difference between SuperStars and SuperPro is minimal, so I would start there. Of course, if you want to run an E-commerce shop, SuperHosting is your best starting point as SSL certificates are free. You have another option for E-commerce with SuperHosting. They offer Shopiko stores with three service levels. Shopiko Start provides up to 50 products, Shopiko Business provides up to 500 products, and Shopiko Pro has unlimited products. If you’re willing to pay for an all-in-one solution, you might consider trying them. However, SuperHosting will be the cheaper option if you know how to create your own webstore. SuperHosting support is excellent as they have phone support, email support, a ticketing system, and live chat, all of which is 24/7. Their searchable knowledge base is quite extensive and covers many technical features of all products offered. Their live chat support is not toll-free. Whether you choose WordPress or SSD hosting, you can’t go wrong with SuperHosting. They offer a robust set of features and outstanding database support making them a great provider for E-commerce sites needing large databases. Their services are affordable and flexible enough for all types of websites.